This is perhaps one of the most contentious questions about infant sleep out there. As I eluded to here in further detail, no, sleep training is not harming the child when done right. While I prefer to call it sleep coaching or sleep learning, there are a few things to consider: The child has to be at least four months of age before a structured attempt at sleep coaching makes sense. The child has to be generally healthy (no ongoing ear infection or the like). You can teach your child to sleep independently even if a he/she isn’t night weaned yet/breastfeeding/bottle-feeding/eating pizza. There is no one-size-fits-all approach so individual as well as family circumstances must be taken into account. Sleep training may be outside of someone’s comfort zone, but that’s an entirely different discussion. Does teething cause crappy sleep for weeks/months on end? No, not if a child has learned to fall asleep independently. Babies can’t put into words what keeps them up at night- and I’m pretty sure the situation is often just as confusing to them as it is to their parents. While pain/discomfort related to teething can make a child restless for those 2 or 3 nights when the tooth actually erupts, there is no evidence to support the notion that teething will cause wakefulness for extended periods of time. How about developmental milestones or leaps? Yes, a baby that’s working on a new skill such as sitting up or walking will most likely use some time in the crib to practice. But same as with the teething: If a child has learned to go to sleep independently, there may be more wake-ups for a while but nothing that should require the parents/caregivers to pull the night shift day after day. Will an ear infection keep my child awake at night? Yes, there’s a good chance that it will. If you suspect an ear infection (or any other health related reason) is keeping your child up, please go and see your pediatrician. I've been told/read on blogs/am convinced that my baby will outgrow their erratic way of sleeping, is this not true? I can’t foretell the future, but here are my $0.02. First off, it is important to determine what we are talking about: In the case of a Newborn, the vast majority generally doesn’t have much of a schedule: they need to eat when they are hungry and they will sleep when they need to- regardless if that aligns with the parents/caregivers’ preferred schedule. And there really isn’t much you can do about it until they develop a circadian rhythm which happens around the 4 months mark. So in that sense one could say that a child eventually falls into their own rhythm. And it is possible that this rhythm coincides with what I would call the perfect schedule, that the baby will sleep the required amount day and night and does so at the biologically appropriate times, and that this also coincidences with the parents preferences. More often than not, it doesn’t happen that smoothly though for a variety of reasons. And if it doesn’t just happen and the parents/caregivers don’t actively pursue a solution, there is no telling how long it can take. Many theories are circulating now about the link between adult insomnia and poor childhood sleep. Do I absolutely need to hire a sleep consultant to finally get my kid to sleep? In one word: No. All the information that I can give you is already out there. I don’t have any privileged information, and I’m not a magician. But my training and experience will help you sort through stuff you may have heard and filter the useful from the useless information. I provide you with support that’s based on science and compassion, and I will give you the confidence that you need to follow through and make the changes that are necessary to be successful. When you’re in the middle of the chaos brought on by lack of sleep and life in general, it can be exceedingly hard to see the forest for the trees and do the necessary homework, devise the appropriate strategies and carry out a coherent plan. That’s where I come in. 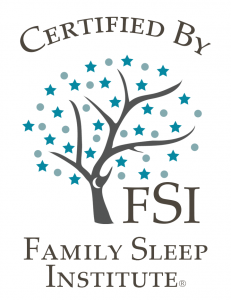 I am certified child sleep consultant through The Family Sleep Institute founded by industry pioneer Deborah Pedrick. The curriculum is comprehensive and rigorous (see covered topics here). There is no one method that is perfect for all children and families, that’s why at The Family Sleep Institute we are required to learn about all the different approaches and keep an open mind to better serve our families. 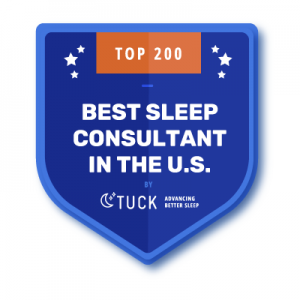 Not only am I required to earn continuing education credits to uphold my certification status, I also have the benefit of a close knit network of other certified FSI sleep consultants to fall back on should a case totally stump me.